General Discussion : Were you at this party? Were you at this party? View Profile Were you at this party? Were you at this party? The hosts don't remember it and they want to know if you were there, if they were there, if anyone was there? View Profile RE: Were you at this party? No, I wasn't, and I don't remember it either! I was supposedly one of the "hosts" but I don't remember this party or even the invitation! Lori doesn't either! I think I went home at 3am because I was too tired to stay up all night! That looks like Christy's handwriting. I have no idea where that address is. It could be my handwriting and we definitely did have a lot of champaigne and daquiris that night....but I googled the address and it doesn't look even remotely familiar. Very strange. It appears to be across the street from some campus with a stone sign out front. WTH? This is definitely your handwriting, Lori. I have zillions of letters that would prove that. I'll Google it too. Maybe I'll recognize something. The Google Earth sat. shows it's on the corner of Harvard and 4th., but whatever is there (I'm assuming a house) is now raized. So unless you can find someone who hasn't pickled that brain cell, I'm no help. Obviously Brad was there since he has an invite...so he should 'member. You 'member, don't cha Brad. 'Member? Okay. Don't know what I was looking at before. I don't recognize the house, but it's across from TU. Hmmm, I typed the address into google and the street view shows a house there. THought someone might recognize it. 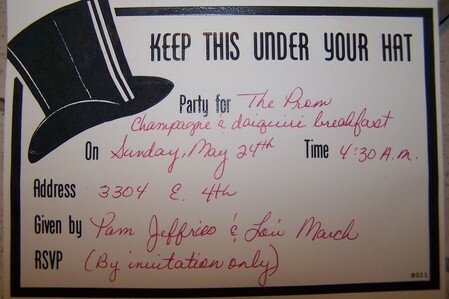 Brad found the invitation among his memorabilia -- but he didn't go to the party. That much he remembers! I now have a better understanding of how much champaigne and daquiris you actually served at the party, which appears to have resulted in a less understanding there even WAS a party!!!! LOL David. It is particularly curious in that I don't even like champaigne and dacquiris!